Teams gather around task boards to plan their day. 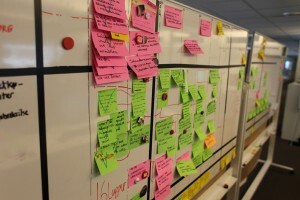 If the conversation and the task board match, we stay on topic and we understand what the rest of the team talks about. Each column represents a day. The top swimline represents testing tasks, the second swim line represents development tasks, and the bottom represents outside influences. In general, each swim line represents a theme for the next few weeks. Each card represents a task. The Scrum Master reads the title of every card from yesterday that has been marked with a green checkmark. These tasks are defined as done. The people who worked on the task may comment. For every task for yesterday that still has a magnet with a face on it, the person on the magnet declares the task as done or continuing. Done tasks get a green checkmark. Continuing tasks are moved to today. For every task planned today, someone puts their magnet on it and thus takes responsibility for the task. Preferably, tasks are claimed by two people who will pair program. The Scrum Master reads every task for today that hasn’t been claimed. The team decides whether they they can commit to it in addition to the rest of the task. If not, it’s moved to tomorrow. The team looks at the rest of the week to make sure that tasks are evenly distributed. They may have to decide to drop tasks in order to get done or to ask for another user story for the sprint in order to have enough to do. We’ve also used marker pens to indicate tasks that take several days (one task on Tuesday and one task on Friday, in this case), and tasks that are dependent on other tasks. We only indicate this when we feel it’s important. With these modifications, the observant among you may have noticed that we have reinvented the Gantt diagram! For the stand-up meeting to be meaningful and stay on-topic, you need to relate it to what you’re actually doing. Have your meeting by a task board that reflects the way you work. Dude, I love to see that this does actually work. I hope one day I can introduce some “agile” changes to my company. 2 Questions: I see MANY tasks, and thus a LONG time writing them all, assigning them, commenting them. How long do your morning meetings take? And second: with those low level tasks, how do you approach, or even budget, a long project? Thank you for the nice comment. I guess you’re based in Spain? Will you attend XP2011? We made this particular board layout when we temporarily merged the morning meetings of two teams. With a total of 14 people or so, the meetings would take around 20 minutes. On average, there would be a little less than one task per person (since people generally pair up). We’ve split the teams again now. 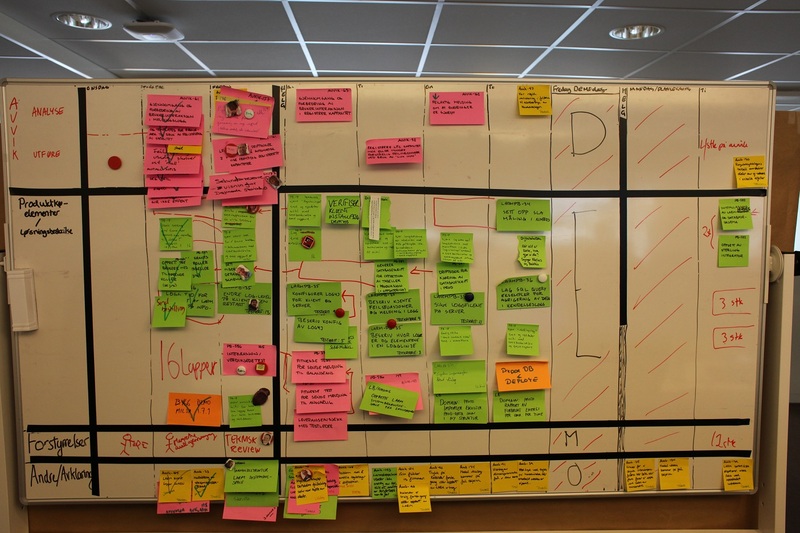 Our whole project is planned using a product backlog a la Scrum. 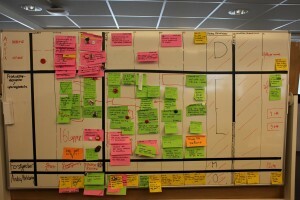 The two teams generally complete 3-4 backlog items each in a 3-week sprint. 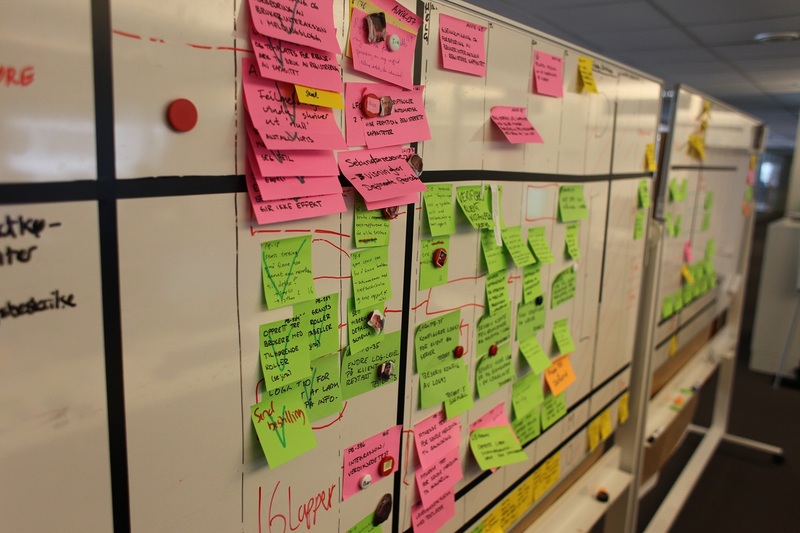 We only break down the backlog items to the level of detail you see on the board when we start a new sprint. The budget issue is too complex to give justice to in a comment like this. I may write about it on my blog as we approach the end of release 2, and I have a better sense of the realism of the budget. Thanks a lot for your replies. I’m indeed in Spain, and I’d love to be on the XP2011, though not sure if I will. Looking forward to that budget entry.